This Chocolate and Peanut Butter Swirl Bark is my creation for The Recipe Redux theme for the month of February which is “your favorite chocolate match”. Hands down, my favorite chocolate match has to be with peanut butter like these Healthy Peanut Butter Cups which I posted back in 2013 (over two years ago) and in the last couple of years have taken over like wildfire on Pinterest (not my recipe, but the peanut butter cup recipe in general). I, of course, didn’t create or invent the Peanut Butter cups idea or recipe, Reese’s did, but I think it’s funny how they are a standard recipe on almost everyone’s blog now. It has to take first prize for food trends on Pinterest lol! Anyway, I used that same basic recipe and instead of making “cups” with them, I made a chocolate bark. This recipe is actually a combination of the Healthy Peanut Butter Cup recipe and my Pomegranate and Dried Blueberry Chocolate Bark recipe. 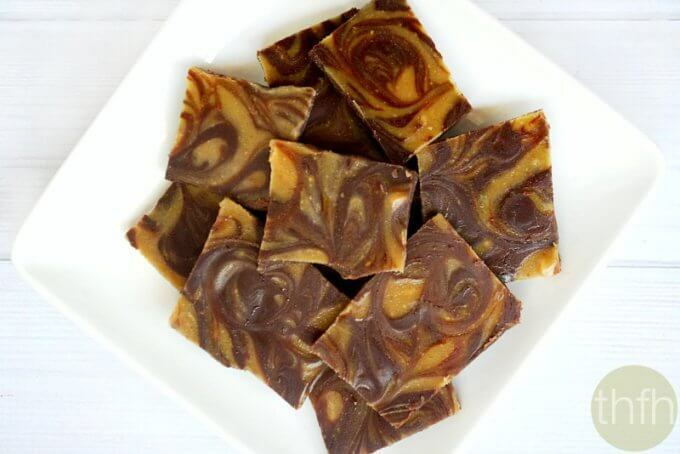 In the peanut butter cup recipe, I used coconut oil in the chocolate and peanut butter mixture and in the chocolate bark recipe, I used raw cacao butter. Just like the peanut butter cups, these can be mixed up in a matter of minutes and all you have to do next is wait for them harden in the freezer to enjoy them. Here’s some ingredients for a similar recipe from Hershey’s Kitchen using only 4 ingredients. Now you may be thinking “it’s not that bad…it only has 4 ingredients”. It’s basically a creation made of highly processed ingredients, GMO’s (soy lecithin, soybean oil), GMO dairy (whey, milk fat), refined sugar and salt, artificial flavors and several unhealthy oils. The peanuts/peanut butter, if not organic, can contain up to 8 different pesticides. So as we can see, just because a product or recipe only has a few ingredients, doesn’t mean they are good for you. This healthier version has only 4 clean, real food ingredients that nourish the body instead of causing it harm. Step 1 Melt the cacao butter for the entire recipe at the same time (total amount 3/4 cup). After it's melted, divide for each part of the recipe (example: 1/2 for the chocolate mixture and 1/4 for the peanut butter mixture). Add all the ingredients for the peanut butter swirl to a small bowl and stir until well combined. Set aside. Add all the ingredients for the chocolate to a small bowl and stir until well combined. Line a square 8 x 8 baking dish with parchment paper and pour in the chocolate mixture. Pour the peanut butter mixture on top of the chocolate mixture in three horizontal rows from left to right. Using the tip of a knife, swirl the peanut butter mixture into the chocolate. Put the dish into the freezer for approximately 1 hour, or until it becomes hard. Remove the parchment paper from the baking dish, then the chocolate bark from the parchment paper and break into bite size pieces. Store in the freezer until ready to serve because it will get soft if left out at room temperature. This recipe will make approximately 20 pieces. 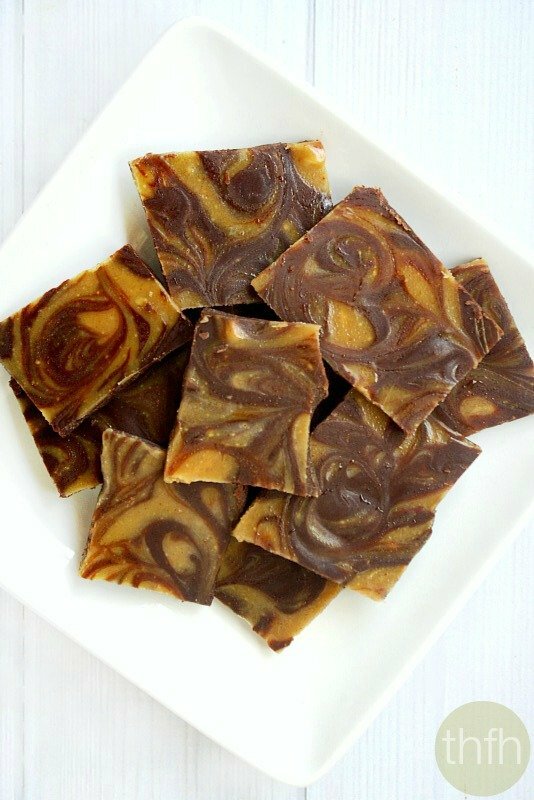 The recipe and photographs for "Chocolate and Peanut Butter Swirl Bark" by Karielyn Tillman of The Healthy Family and Home are licensed under a Creative Commons Attribution-NonCommercial 4.0 International License and cannot be used without my written permission. Ahh, these look so good! I love that there are only a small number of ingredients. I have all of these ingredients at home…hope to make them this week! Amazing looking recipe, we HAVE to try this ourselves soon! Looks yummy. 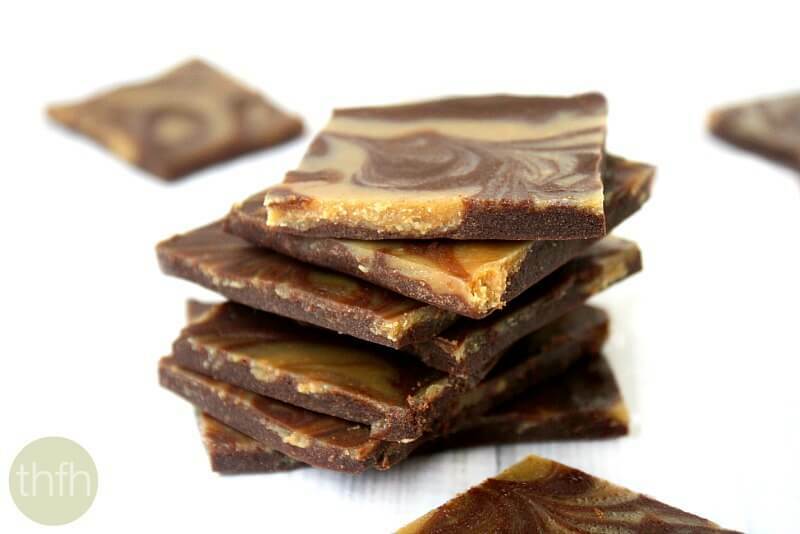 Congrats on your PB Cups taking off on Pinterest. I can see why! Is raw cacao butter pretty easy to find? I certainly don’t take credit for their popularity, but they sure are good (and really easy to make) if you’ve never tried them. Yes, raw cacao butter is fairly easy to find…Amazon, Vitacost, Whole Foods, Nuts.com, LiveSuperfoods, Sunfoods, etc and places like that. It’s a little pricey but a must have when makings homemade raw chocolate. thanks so much for the info about the cocoa butter! So helpful and so so interesting.